Welcome to the vi family of text editors. It is the universal text editor for the Unix/Linux operating systems. The stock Unix vi and the open-source vim (and various other clone editors such as neovim, nvi, elvis, and stevie) are all based on the original 1980’s Berkeley vi program written by Bill Joy (the same guy who wrote the C Shell). The vi editor is the standard editor available on most every Unix-derived system, including Unix, Linux, MacOSX, and BSD. Every Unix and Unix-like system has it. Even the embedded software in your home router may have a version installed (e.g. DDWRT, OpenWRT). Understand that vim is a plain text editor. Be sure you are using the modern vim version of the vi editor. Print the front of the recommmended reference card. Set the essential options, especially if you have a dark screen (PuTTY). The vimtutor command starts a tutorial that teaches you the basics. vi is a pure (plain) text editor – just text, no fonts, no formatting. It will not edit word-processing documents such as MSWord or OpenOffice or printer-ready documents such as PDF files. 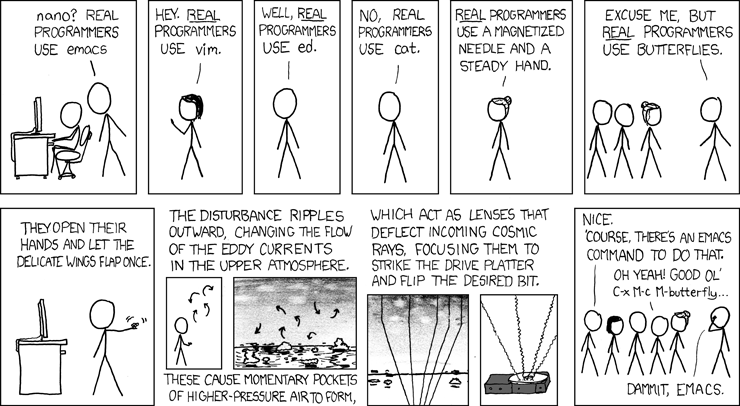 The name vim means “Vi IMproved”. It is a rewrite and massive enhancement of the original vi editor written in the 1980s. You will occasionally come across the old vi version in embedded or non-Linux systems; the basic editor commands are the same. Some versions of Linux install a smaller, limited version of vi as the default editor and you have to explicitly ask for an upgrade to get the full vim version with all the great features. The command gvim (if available) starts an X11 GUI-based version of vim in its own window. The Linux command vi is usually a link to vim; they are the same. Some distributions (e.g. Fedora 12) install a smaller, less feature-filled version of vim as vi (e.g. /bin/vi), but then use system aliases to alias vi to a larger version with the name vim (e.g. /usr/bin/vim), so that you never really know which version you’re getting. This document will assume that vi and vim are the same, fully-featured, program. It will use vi and vim interchangeably. VIM is an easy-to-use but hard-to-learn text editor. It is notoriously difficult to learn, but once learned, is very easy to use. The vim editor is keyboard-based; it doesn’t use the mouse. It doesn’t need the X Windows GUI system to be running; you can use it over a serial line and a dial-up modem. Similar to learning to touch-type on a keyboard, the vim editor is difficult to learn but easy to use once you have some mastery of it. Until you get used to it, you will find using vi awkward. Once you master it, you will easily outperform anyone using a mouse-based editor such as Notepad. Learn the tool! The single-character command keys used in vi have found their way into other programs. The bash shell supports a vi mode for editing command lines, and the less and more pager programs (used by the man command) use vi commands to move around the screen and search for text. The vi editor is incredibly powerful. Most students refuse to learn it well enough to get out of the awkward stage. They go into vi insert mode and perform all text editing using the arrow and backspace keys, turning vi into a slower, mouse-less version of Notepad! If you want a Unix/Linux job, learn the editor tool! If you want to use arrow keys, us the Pico or Nano editors instead (but don’t expect to get a Linux job). Almost every letter, upper and lower case, is a VI command. 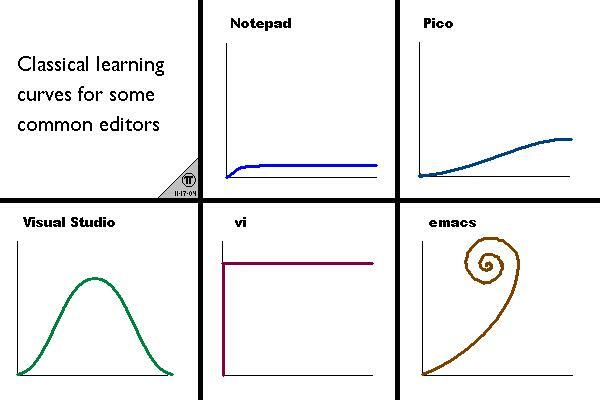 The more you learn, the faster you can edit. While you may begin by learning to delete a word slowly using ten x commands, eventually you should evolve into knowing how to use the single quick dw command. When the terminal window is 80x25, type vimtutor at a shell prompt. You can sometimes get the tutorial in French by typing vimtutor fr and in Spanish by typing vimtutor es. The versions of the tutorial in non-English languages may be much older than the English versions. Use the English version for the latest tutorial. Other languages may be available. You might still be able to find the VIM tutorial even if the vimtutor command is not installed. Look around; see the appendix below. Stay out of INSERT mode! Do not use the arrow keys! Most of what you do in an editor is move around and change text. That means you should always be in command mode in VIM, not INSERT mode. In command mode, your keyboard lets you move around and edit text. In INSERT mode, all you can do easily is type text; moving has to be done with the arrow key and that is very slow. Do not use the arrow keys to move the cursor – keep your hands on the keyboard “home” row and use the command-mode letters h,j,k,l instead. The letters don’t require you to move your hands from the home row on your keyboard, and they encourage you to remain in command mode where you can use all the VIM commands. Constant use of INSERT mode and arrow keys will slow you down and make you look like an amateur. When you edit a file containing a line of text longer than the width of your VIM window, the long line of text will usually “wrap around” to the beginning of the next line, and keep wrapping onto following lines if the line is really long. One long line will appear to be many lines. A wrapped line of text is still one line in the file and in the editor; it simply displays as multiple lines on your screen. When you delete the one line, the entire line disappears, including all its wrapped parts. Longer lines will wrap around the screen; they are still one line. Don’t write lines longer than 80 characters. 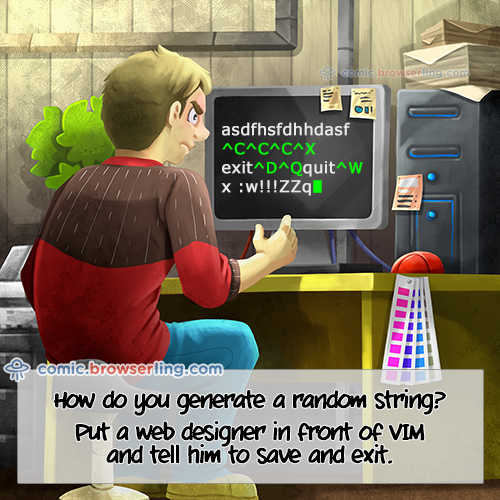 VIM comes with hundreds of options that influence how it works. You can set the options at any time; but, to save them and have them used every time you start VIM, you need to put commands into a file named .vimrc in your HOME directory. The full vim editor has help available by typing :help, e.g. you can type :help showcmd. This splits your terminal screen and opens up a help file inside vim for the showcmd option. To close the help file, just do :q as you would do to close any open file. The above shell command line appends the options to your .vimrc file. 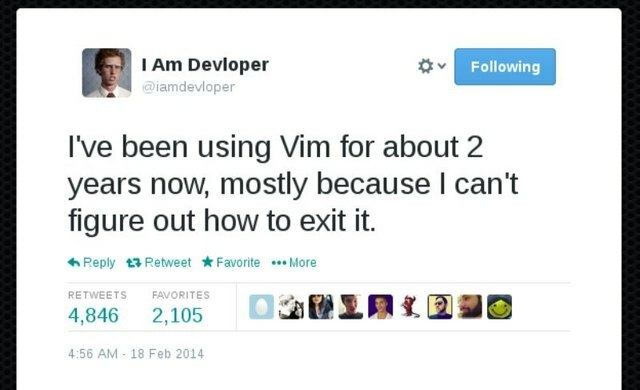 You only need to do this once; VIM will read the file on start-up. If you execute the above command more than once, you will put multiple copies of the options into the file. This isn’t an error; but, it isn’t necessary either. Edit the file and remove the duplicate lines. Some people also like to have options set number and set spell in their .vimrc. If you use a terminal emulator with a dark/black background (e.g. PuTTY), you will find that VIM chooses poor colours for syntax highlighting. In particular, comment lines (starting with hashtag #) are shown as an unreadable dark blue colour on black. Note the American spelling of color. You can get direct help on the colorscheme command inside VIM, and you can get help on the set command inside VIM and search for background in the set help page. The above commands will perform most any edit on any file you have. All the other things in VI simply make the editing faster and get you better marks (and a better job) in less time. Any job interview will ask you to edit a file and watch how proficient you are at making changes. Some of the other VI commands make the editing much, much faster. Compare dd (delete a whole line) with typing 80 x commands, or :1,$s/idallen/alleni/g to replace every occurence of idallen with alleni in the whole file using a single global search and replace! Use any of the online tutorials to learn more. The VIM tutoral has details on many of these commands. If you spend a lot of time typing plain text, writing programs or HTML, you can save much of that time by using a good editor and using it effectively. This paper will present guidelines and hints for doing your work more quickly and with fewer mistakes. This section shows off two of the more advanced and cool vi/vim editor features. You can send any number of lines from your editor buffer into the standard input of any command. The command may process those lines and the output of the command will replace the lines in the editor buffer. The command you run doesn’t even need to read standard input; the output of the command will replace the lines in the editor buffer. Open a new file in VIM and enter a dozen lines of random text into the editor. All the lines are run through the sort command. The line is replaced by the output of the date command. Move the cursor to any line in the file and open a new blank line. Quit the editor without saving anything. You can record any simple or complex sequence of editor commands into a single-letter macro that you can re-execute. Recorded macros are not saved when you exit the editor, but you can save them yourself by defining them in your .vimrc file. We will define a macro that adds stars after the fourth colon character in a line. Copy the text file /etc/passwd into the current directory. Open the copy of the file in the vim editor. Append three asterisks and a space after the cursor (and always exit insert mode with ESC; type five characters): a*** ESC The first line of the file should now have three asterisks in it, located after the fourth colon character. Make sure you are no longer in input mode. (Use ESC!) Close the editing macro by typing a single q that turns off the recording flag. The recording flag should be gone from the status bar at the bottom of your screen. Macro q is ready to use. Move to the beginning of any other line in the file and re-execute this macro by typing: @q Note how the macro executes the same editor commands and makes the same change to this line. Move to the second colon in any line in the document and re-execute the macro: @q Note how the macro makes the same change after the sixth colon, because it moves forward four colons from your current position. You can record macros that make extremely complex changes to a file and then make those same changes in other parts of the file using the macro. Go to any line and try the new macro. Instead of adding asterisks, it will add the words “Fancy Macro”. You can dump and modify any macro after you have recorded it. This section is only for people using VI/VIM over a remote connection. If you use VI/VIM in a Linux terminal window, things usually work fine. Make sure your terminal is correctly configured before you enter VI remotely! The VI/VIM editors must know how to drive your terminal during an edit session; if you see anything about an “unknown” terminal type when you start up the editor, you must exit immediately and fix the terminal type to be one that VI/VIM recognizes. To be safe, do not change the size of a VI/VIM window when the editor is open in a remote window. If the command vimtutor doesn’t work, you will have to locate and copy the tutorial file yourself. On most Unix/Linux machines, you will find the tutorial somewhere under the directories /usr/share/vim* or /usr/local/share/vim*, e.g. possibly /usr/share/vim/tutor/tutor. Different Unix systems put the tutorial in different places; go look for the file named tutor under the above places. The VIM tutorial is a file named tutor under directory /usr/share/vim/vim63/tutor/ on Fedora 12 and under /usr/share/vim/tutor/ on most Linux systems. $ cp /usr/share/vim/tutor/tutor tutor     # use the actual pathname! Use the actual pathname to the tutor file on your system. Follow the instructions in the tutorial. The VIM tutorial was written to be used under various operating systems, including MS-DOS; so, it has one or two MS-DOS specific external commands in it (e.g. there is no DEL command in Unix – use rm instead!). Also, if you have set ruler turned on, the Ctrl-g command will not show your current line number; because, the ruler line already shows it for you. You can find good “cheat sheets” on VI by searching on the Internet for “vi editor cheat sheet” or “vi editor summary pdf” or “vi reference card”. I’ve edited the front side to make some of the text clearer and to add some missing “essential” commands such as ^R (redo). The back side is optional.